“Designers come from a pool of energy that is, in some shape or form, trying to improve life,” says London-based designer Paul Cocksedge. The observation was part of an interview he gave to Innovation Hong Kong while in the city to coincide with the launch of one of his art installations. “Spectrum” is described as a “pop-up” space as well as functioning as a VIP lounge for Hong Kong-based real estate firm Swire Properties Ltd for speakers it invited to the “Swire Properties Dialogue Series”. The series of talks and panels was one of the strands of Art Basel Hong Kong 2019. The overall event – with public viewings from March 19 to 21 – took place at Hong Kong Convention and Exhibition Centre in Wan Chai. 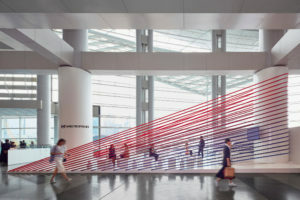 Bands of red and blue fabric – used in a way reminiscent not only two of the colours in Swire Properties’ corporate logo but also the logo’s geometric style – marked the boundaries of the lounge area. The third colour of the corporate logo – white – was represented by appropriate flooring and white-coloured furniture that was minimalist in style. “Obviously, we are not bringing things backward – we’re trying to innovate, make a change and create special moments, spaces and connections,” stated Mr Cocksedge, referring to the role of his work and his profession. He completed another piece of work for Swire Properties last year. 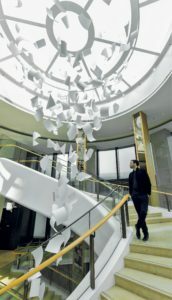 “Gust of Wind” was installed in the shopping mall at the firm’s HKRI Taikoo Hui real estate development in Shanghai, mainland China. It was formed from several suspended, curved structures resembling a stack of papers blown into the air by a gust of wind. It was the development of a theme the British designer had touched on in an exhibit created for the London Design Festival in 2010. The connection between the pure and physical sciences, and art, has been a feature in several of Mr Cocksedge’s works, and from where he draws inspiration to innovate in his projects. The idea of being a designer occurred to him “half by accident” as he originally intended to be a pilot. “I decided to study maths and physics. Then I worked out that I was finding it very difficult regarding certain aspects of the academic side of learning science… and I realised I was scared of flying,” he told us. “I like science, creativity, a sense of freedom and motion: and then somehow art and design entered my life. It allowed me to be that free spirit,” the designer explained. Principles of mathematics and physics were applied in his work “Poised”, a table fashioned from steel, and which weighs approximately half an imperial ton (508 kilos). The structure is shaped like a part-formed letter “u” lying on its side, but with the larger top plane of the table bent away from the perpendicular relative to the shorter but heavier supporting plane. The table looks as though it might topple over at any moment but is in fact stable thanks to careful calculations regarding gravity, mass and equilibrium. “That is really satisfying, taking the square, curving it to make a form. That began a series of work, which was about this idea of suspending these curved forms within a space,” Mr Cocksedge told Innovation Hong Kong. He said a challenge for every designer was “getting the image as close as possible to the original idea”. That was a challenge with his “The Living Staircase” project – featuring spiral stairs with no column – in the Ampersand, an office building for creative technology businesses in Soho, central London. The staircase was created in collaboration with the engineering firm Arup Group. The spiral structure, serving four floors, has three small areas at intervals in the coil of the staircase, where people can sit if they wish. “We’ve taken the column out and left these three spaces where people – instead of just walking up and disappearing onto the floor – they walk up, around and in [these spaces],” Mr Cocksedge explained. “With most projects there’s a lot of pressure to come up with an idea. You develop these ideas [to show to clients], but then you need to make them work, to make them stand up. That’s the challenge, making one of your creations a reality,” Mr Cocksedge noted. Some of his designs have been inspired by observable natural phenomena. 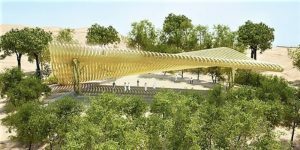 One project on which he is currently working is an asymmetric steel canopy in the world’s largest botanical gardens in the state of Oman in the Arabian Gulf. It is designed to function as a sunshade. Information regarding planetary movements and other data has been analysed, in order to ensure the shade function of the structure tracks the Sun’s position during daylight “What we did was instead of just drawing and designing something for it, we actually looked to the Sun for inspiration,” he told us. 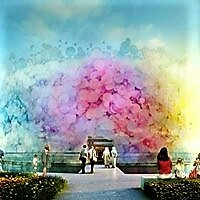 Another project that the designer has undertaken – one that also captures the Sun’s movement – is what is termed as a living watercolour pavilion. It is formed of thousands of overlying glass discs. 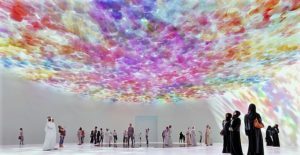 The design project was selected as a finalist for the United Kingdom National Pavilion to be set up for Expo 2020, an event to be held in Dubai. 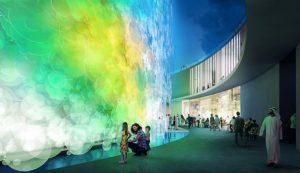 “That project was actually about the perception of how to create a pavilion that really talks about collaboration, which is the theme of the Expo,” the designer said. “When you’re looking at this pavilion, what you’re actually looking at is the colours from all the participating countries, and you get the sense that people might think this is kind of nice to look at. When they find out that the colours come from all of the countries, the United Kingdom is seen as being outward looking, open to collaboration, and that’s a very positive image especially in today’s political climate in the U.K.,” he added. Working with natural phenomena as a source of creative inspiration often means “dealing with scientific principles”, Mr Cocksedge stated. Light is an example, said the designer. 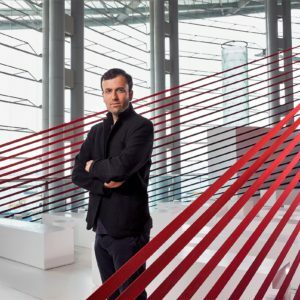 “It is always fascinating us as a [design] studio because it changes everything: the way you perceive [objects], your mood; and is so linked to science and technology,” and yet “it’s something real,” rather than something theoretical, he remarked. He is also creating a “scent project” for a South Korean consumer brand based in Seoul. Self-generated works are equally as attractive as commissioned commercial projects, said Mr Cocksedge. “A lot of designers need a brief. I was taught… by people like Ron Arad, my professor at the Royal College of Art. He’s fine with just a piece of paper and a pen. He can start designing. I come from that line of thinking. And I hope to be seen in the same line like Ron,” Mr Cocksedge said. The designer also said he aspired to bring to observers and users of his work “positive vibe” and “beautiful moments”.“It is about trying to find a way for a piece of work to make sense: at least it has to make sense … for myself, the team and [when] working with the client … I don’t want to do things that are upsetting. I want to do things that people enjoy,” he remarked.